A man who went to Church with his wife fell was always falling asleep during the sermon. 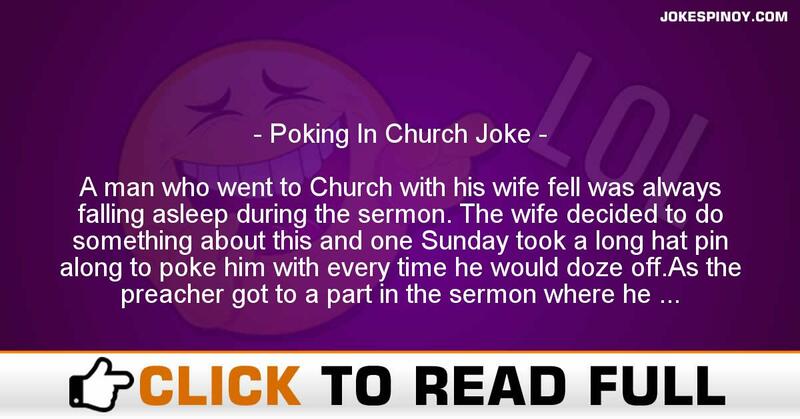 The wife decided to do something about this and one Sunday took a long hat pin along to poke him with every time he would doze off.As the preacher got to a part in the sermon where he shouted out “… and who created all there is in 6 days and rested on the 7th..” She poked her husband who then came flying out of the pew and screamed “Good God all mighty”.The minister said “That’s right, that’s right” and went on with his sermon.The man sat back down, muttering under his breath and later began to doze off again when the minister got to “… and who died on the cross to save us from our sins…” the wife hit him again and he jumped up and shouted “Jesus Christ”.The Minister said “that’s right, That’s Right” and went on with his sermon.The man sat back down and began to watch his wife and when the minister got to “… and what did Eve say to Adam after the birth of their second child” the wife started to poke the husband but he jumped up and said “If you stick that damn thing in me again I’ll break it off”! ABOUT US : Laughter is the best medication as the old expression says, we at JokesPinoy.com will give you all the comical filipino quotes and photographs in tagalog language. Back in 2013, a group of Filipino OFW (Overseas Filipino Worker) got bored and they make an effort to look for some amusing quotes on the internet simply to have fun but unfortunately most of the websites they discovered on that time are having an old jokes and have no interaction with the users. From that moment, they subsequently got an idea to build their very own jokes website and let other users to give their jokes or comment with the present jokes. Following the funds and concepts collected, JokesPinoy.com was born, a website that let the user share their jokes and let them have conversation with other users as well. Since the website has been launch, tens of thousands of visitors are coming each day to read jokes and have fun on the website and too as giving their view on the jokes they read. We hope from JokesPinoy.com that this website may provide you some grin and happiness, Life is Short so have fun on it. DISCLAIMER: A number of the jokes, pictures and videos seen in this site are not created by us, they may be created by our users or they simply get it somewhere in the internet only like 9gag, youtube, metacafe, vimio and etc. We respect copyright info which is posted here including funny pictures and funny videos. If encase there are files posted here in our site which is owned by your and you do not want to share it to anybody then fell free to contact us to remove it. Majority of the language used on this particular site was in tagalog and some are bisaya that are both filipino language which originated from Philippines, should you need to interpret the joke to english you can used an online translator to translate it from tagalog to english.